FINLAND’S EMBASSY STAFF LEAVING SYRIA…….. – The Tundra Tabloids……. FINLAND’S EMBASSY STAFF LEAVING SYRIA…….. They shouldn’t have been there (any more than the US) in the first place. Any state that actively promotes, shields terrorists, is by my definition, a rogue state, and should be given a diplomatic stiff arm. Many of the Finnish academics who are virulently anti-Israel, like Jaakko Hämeen-Anttila, have real close ties with the Assad regime, otherwise they wouldn’t have been allowed in. Now he’ll just have to wait until either side wins. 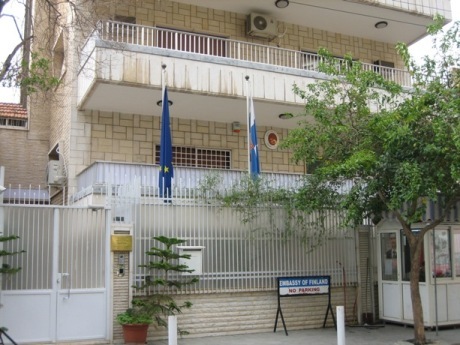 Finland has closed its embassy in Damascus due to the deteriorating security situation in the country, according to Finland’s Foreign Ministry. Finland has also urged people to avoid any travel to Syria while any Finnish citizens in Syria have been advised to leave the country. The staff posted to the Finnish embassy in Damascus has left Syria until further notice. Previous Post Previous Post SHARIA CREEP IN AUSTRALIA ACTUALLY FULL RUNNING MARCH……..
Next Post Next Post FINNS PARTY IN VANTAA WANT TO REFUSE PUBLIC MONEY FOR SOMALI ‘SUMMER CAMP’, SOMALIS CRY FOUL……..